1st: Jankowski grounded out to second. 2nd: Jankowski singled to center. 5th: Jankowski grounded out to pitcher. 7th: Jankowski reached on bunt single to pitcher, Richard to third. 9th: Jankowski reached on infield single to shortstop. 2nd: Hosmer struck out swinging. 5th: Hosmer grounded out to third. 7th: Hosmer grounded out to pitcher. 9th: Hosmer grounded out to. 1st: Cordero doubled to right, Hosmer to third. 3rd: Cordero struck out swinging. 5th: Cordero grounded out to shortstop. 8th: Cordero struck out swinging. 1st: Pirela doubled to left, Hosmer and Cordero scored. 3rd: Pirela flied out to center. 6th: Pirela lined out to left. 8th: Pirela grounded out to shortstop. 1st: Villanueva doubled to left, Pirela scored. 3rd: Villanueva struck out swinging. 6th: Villanueva grounded out to third. 8th: Villanueva homered to left (418 feet). 1st: Galvis struck out swinging. 4th: Galvis grounded out to first. 6th: Galvis grounded out to shortstop. 8th: Galvis grounded out to third. 1st: Reyes flied out to right. 4th: Reyes singled to left. 7th: Reyes grounded out to third. 9th: Margot safe at first on error by shortstop Mercer. 2nd: Lopez struck out swinging. 4th: Lopez flied out to center. 7th: Lopez struck out swinging. 9th: Lopez hit sacrifice fly to right, Margot scored. 2nd: Richard grounded out to shortstop. 4th: Richard grounded out to first. 7th: Richard doubled to center. 9th: Spangenberg homered to right (395 feet). 1st: S. Rodríguez grounded out to third. 3rd: S. Rodríguez struck out looking. 6th: S. Rodríguez grounded out to pitcher. 8th: S. Rodríguez doubled to deep center, Mercer scored, Díaz to third. 1st: Osuna grounded out to pitcher. 4th: Osuna grounded out to first. 7th: Osuna flied out to right. 8th: Osuna struck out swinging. 1st: Cervelli struck out looking. 4th: Cervelli lined out to left. 7th: Cervelli flied out to right. 8th: Cervelli lined out to left. 2nd: Bell lined out to right. 4th: Bell flied out to left. 7th: Bell tripled to center. 9th: Bell grounded out to third. 2nd: Dickerson singled to center. 5th: Dickerson grounded out to second. 7th: Dickerson grounded out to first. 9th: Dickerson flied out to center. 2nd: Freese grounded into double play, shortstop to second to first, Dickerson out at second. 5th: Freese grounded out to shortstop. 8th: Freese doubled to center. 9th: Freese lined out to right. 3rd: Meadows grounded out to pitcher. 5th: Meadows grounded out to second. 8th: Meadows grounded out to second, Freese to third. 3rd: Mercer singled to left. 6th: Mercer singled to left. 8th: Mercer singled to center, Freese scored. 3rd: Kingham bunted into fielder's choice to catcher, Mercer out at second. 6th: Frazier grounded into double play, first to shortstop, Mercer out at second. 8th: Díaz singled to center, Mercer to second. Clayton Richard allowed two runs in 7 1/3 innings, Christian Villanueva homered and drove in two runs, and the San Diego Padres beat the Pittsburgh Pirates 6-2 on Saturday night. 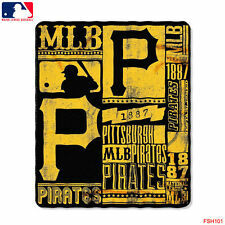 New Northwest MLB Pittsburgh Pirates Large Soft Fleece Throw Blanket 50" X 60"
Arizona Diamondbacks right-hander Zack Greinke will try to break his Wrigley Field curse on Saturday afternoon in a big-name pitching matchup at the Chicago Cubs. The Pittsburgh Pirates will take a four-game winning streak and the National League's best record into the second game of a weekend home series Saturday against the San Francisco Giants. A third baseman of the future and a likely soon-to-be third baseman of the past hope to duplicate Friday's hitting success when the Oakland Athletics host the Toronto Blue Jays for a second straight day on Saturday afternoon.